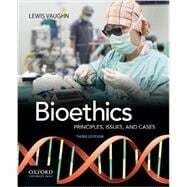 Bioethics: Principles, Issues, and Cases, Third Edition, explores the philosophical, medical, social, and legal aspects of key bioethical issues. Opening with a thorough introduction to ethics, bioethics, and moral reasoning, it then covers influential moral theories and the criteria for evaluating them. Integrating eighty-nine readings--twelve of them new to this edition--numerous classic bioethical cases, and abundant pedagogical tools, this text addresses the most provocative and controversial topics in bioethics. Lewis Vaughn is the author or coauthor of numerous books, including The Power of Critical Thinking, Fifth Edition, (2015), Philosophy Here and Now, Second Edition (2015), Living Philosophy: A Historical Introduction to Philosophical Ideas (2014), Philosophy: The Quest for Truth, Ninth Edition (2013), and The Moral Life, Fifth Edition (2013), all published by Oxford University Press. Chapters 3-10 include an "Applying Major Theories" section. Chapters 3-11 include Cases for Evaluation. Each chapter includes Key Terms, a Summary, Further Reading, and Notes. In Depth: Can Virtue Be Taught? In Depth: Do Patients Want the Truth? Do Physicians Tell It? Classic Case File: Carlos R.
In Depth: Why Enter a Clinical Trial? * In Depth: Does a Fetus Feel Pain? "An Almost Absolute Value in History," John T. Noonan, Jr. In Depth: Euthanasia and Physician-Assisted Suicide: What Do Doctors Think? "Rights to Health Care, Social Justice, and Fairness in Health Care Allocations: Frustrations in the Face of Finitude," H. Tristram Engelhardt, Jr.
* "Public Health Ethics: Mapping the Terrian," James F. Childress et al.